When publishing SSL-protected web sites such as Microsoft Outlook Web App with Forefront Threat Management Gateway (TMG) 2010 or Unified Access Gateway (UAG) 2010, it is often desirable to allow clients to enter the URL of the site without specifying the HTTPS protocol explicitly. 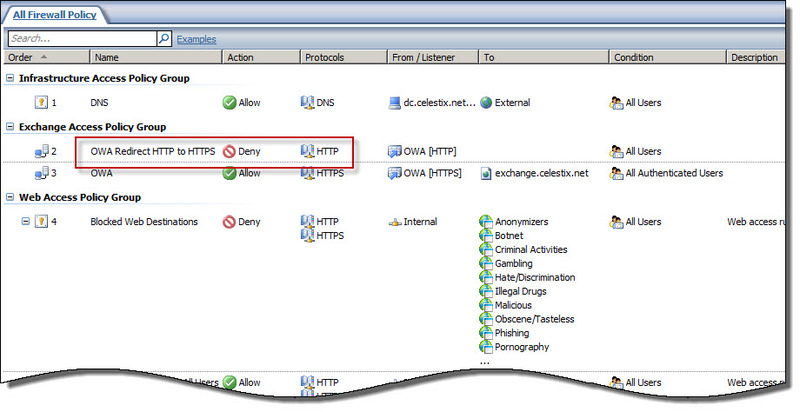 For example, when publishing Outlook Web App (OWA) 2010 where the full URL ishttps://mail.celestix.net/owa/, for convenience an administrator might want to redirect non-secure requests for http://mail.celestix.net/owa/ to use the secure HTTPS protocol automatically. This can be done in a number of ways, depending on which Forefront solution is used for publishing. Even more convenient is to redirect requests for the base URL http://mail.celestix.net/ to the correct path https://mail.celestix.net/owa/. The easiest way to accomplish this is to create a new publishing rule that denies requests to http://mail.celestix.net/ and redirects them to https://mail.celestix.net/owa/. To enable this functionality, use the Web Site Publishing Wizard to create a publishing rule that denies access to http://mail.celesitx.net/and redirects those requests to https://mail.celestix.net/owa/.